Most parcels of real estate are highly valued by their owners in both an emotional and a monetary sense. For homeowners, the property may be the place where they have watched their children grow up or where they hope to raise a family . For business owners, a particular property may be essential to the dreams they hoped to fulfill when they began their businesses. Add on top of that the fact that for most people, real estate is the largest investment they have and they deserve to have that investment protected. This makes is so important that any eminent domain takings are absolutely necessary and that when one occurs the property owner is fully compensated for the property that was taken. Attorney Greg Stoner of the Property Rights Law Firm, P.A. 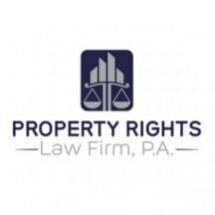 has decades of experience helping people fight against government takings of their property and maximizing the compensation they receive when their property is condemned. Attorney Stoner's extensive experience can help you effectively navigate the eminent domain process. The government has substantial resources that is uses to achieve its eminent domain goals. Attorney Stoner helps to level the playing field for his clients. Majestic Clommercial Condominium Property Owners Association, Inc.
Grace Tabernacle of Worship, Inc.